This is what I did last night after the Happy Hookers meet-up. 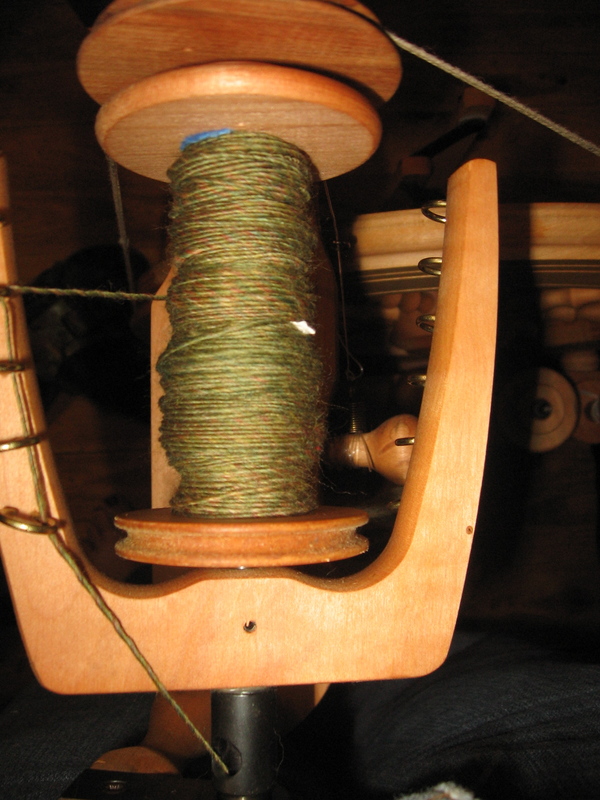 I started spinning up some of the rovings that I bought at Rhinebeck. The name of this colorway is “Sage” and I only have half a pound of it. It is (I believe) 100% merino wool. 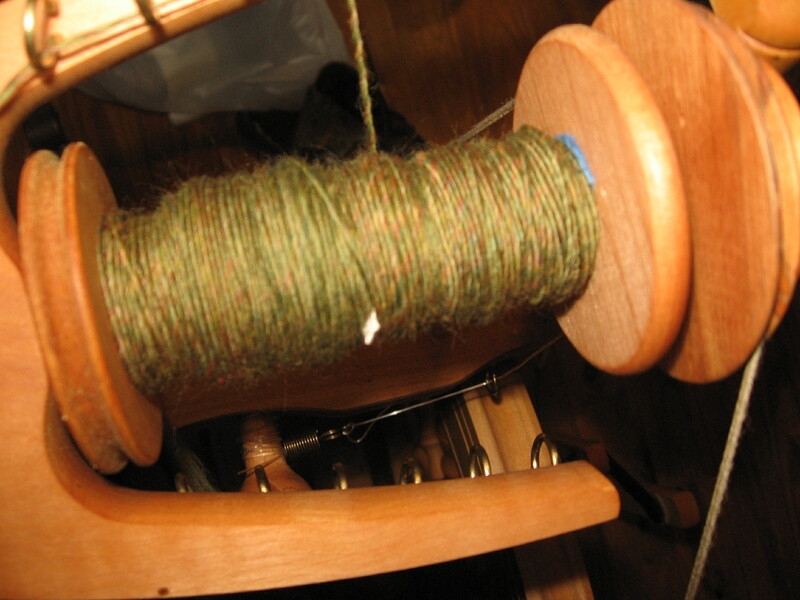 I am not sure that I like spinning merino. I am sure that this is some sort of sacrilege to say, but it just doesn’t flow like some of the other wools. I now understand why I had so much trouble maintaining a single when I was learning to spin as this is what I was learning on. However, the single already feels like silk…. 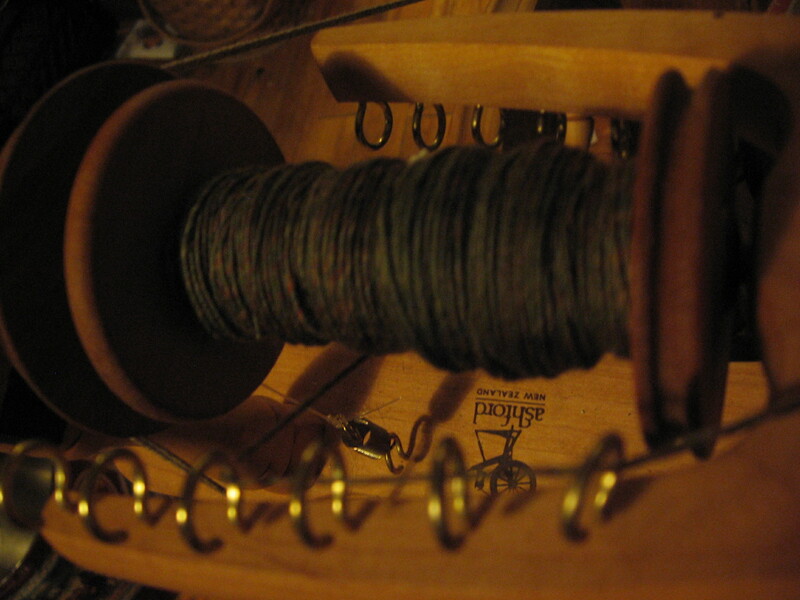 It is interesting to spin because it isn’t just green. It also has bits of pink in it, even some yellow. Coming from reading Amy O’Neill Houck’s blog The Hook and I, I may have found the pattern that pushes me over the edge. The one that will make me want to try knitting yet again. She has just had a pattern put put by Twist Collective and I took a look around. That is where I came upon sylvi. In some totally unrelated new. I was just told by my mother that my little brother will begin his second deployment in 2010 (I know it sounds like a long way off, but it is way less than 2 years away). His first deployment was to Iraq and he was gone for about 15 months. This time is will be to Kosovo for peacekeeping. As a big sister, I like this assignment a lot better! However, it is hard on my family as my brother helps out with the farm a lot now that my dad is getting older. It also means that he will miss a lot of time from his job, which is super supportive of it’s National Guard members. At least by that time the hubby and I will be in the UK, so we will be able to go visit him pretty easily and he will be able to come hang with us during his breaks if he wants to. So that will be pretty cool. At least, thank God, he isn’t going back to Iraq or Afghanistan. I hope that very soon no ones little brother, or son, or husband will have to go back to either of these places. So, I have a timer set so that I can tune to the local NPR station to listen and watch the space shuttle take off tonight. They are carrying stuff to do a little fixing up in the International Space Station. Night launches are always the coolest since they are the easiest to see this far out. Godspeed astronauts, y’all have bigger ones than I ever will…. Ok honey, whatever you say…….